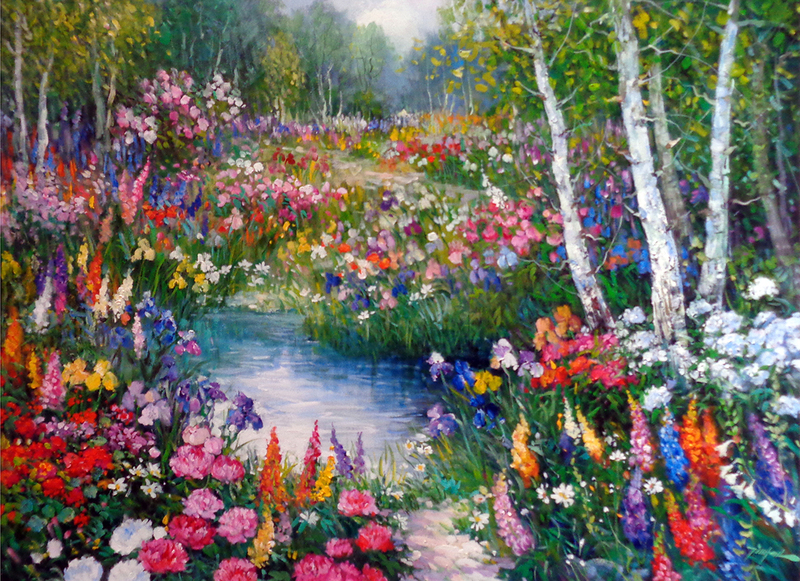 Born in Hin Kwong Village of Kwangtung, China to a family of artists, he became a popular floral and landscape artist in Canada in the late 20th century. His style combines abstraction and impressionism, and he seeks to paint familiar subjects. He studied at the Mid-Southern Academy of Fine Arts in Wu Han, Hubei, and at age 19 enrolled at Canton Academy of Fine Art. In 1962, he moved to Hong Kong and was appointed Chief Designer by the United Nigerian Textile Company, West Africa. He went from Nigeria to Paris with Ecole Nationale Superieure de Beaux Arts, and in 1967 moved his family to Vancouver, Canada where he received the Federation of Canadian Artists senior status, limited in Senior Members to only 25. His work reflects the diverse cultural aspects of his life: the strict discipline of the Chinese brush painting tradition, western Impressionism, and Asian floral arranging from bowls and vases of the extensive collection of his wife, Nita. 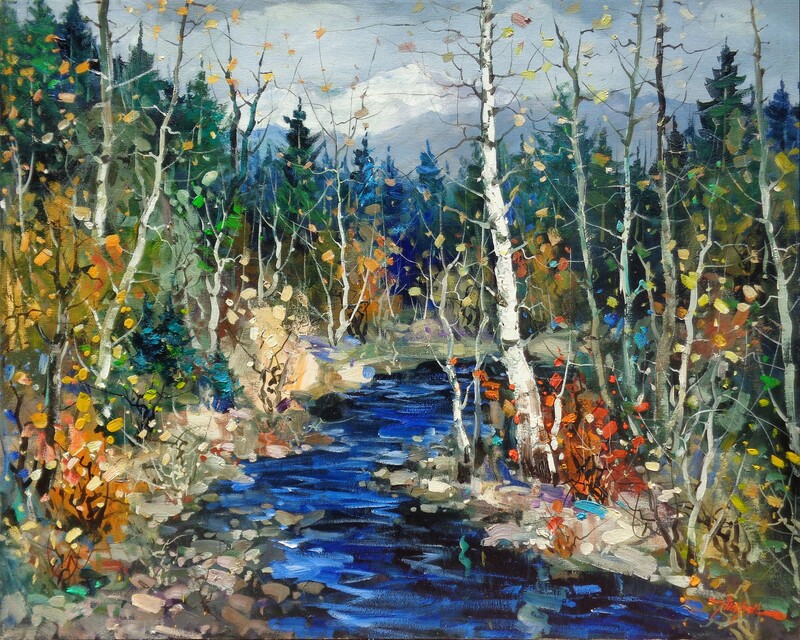 His paintings are in the collections of the University of British Columbia, The Federation of Canadian Artists, the Royal Collection of the King of Thailand, and the Kirby Society of Calgary, Alberta. Painter Tinyan Chan creates a compelling blend of Asian and Western aesthetics in his snowscapes and floral scenes. He is multi-talented, producing brilliant works in both watercolor and in oil. These Eastern elements are complimented by Tinyan’s energetic impressionistic style and his fearless use of brilliant color. Delineation of tree branches recalls the curves and strokes of Chinese calligraphy, as does his subject choice of serene natural scenes. Strokes of fuchsia, yellow, and turquoise combine in perfect harmony where the viewer would expect them to clash, creating beautifully balanced compositions of pure color. Tinyan was born in Hin Kwong Village, Go Yew county, Kwangtung, China, in 1942. The youngest of a family of artists, Tinyan studied at the Canton Academy of Fine Arts, eventually moving to Hong Kong to set up a studio with his brother. From there, the artist moved to Africa to design fabric prints for the Nigerian Textiles Company Limited. The simple village life Tinyan experienced in Africa gave him a sense of tranquillity that has permanently influenced his art. Tinyan followed his time in Nigeria with travels throughout Europe, studying extensively in Paris at the prestigious L’Ecole National Superieure de Beaux-Art. 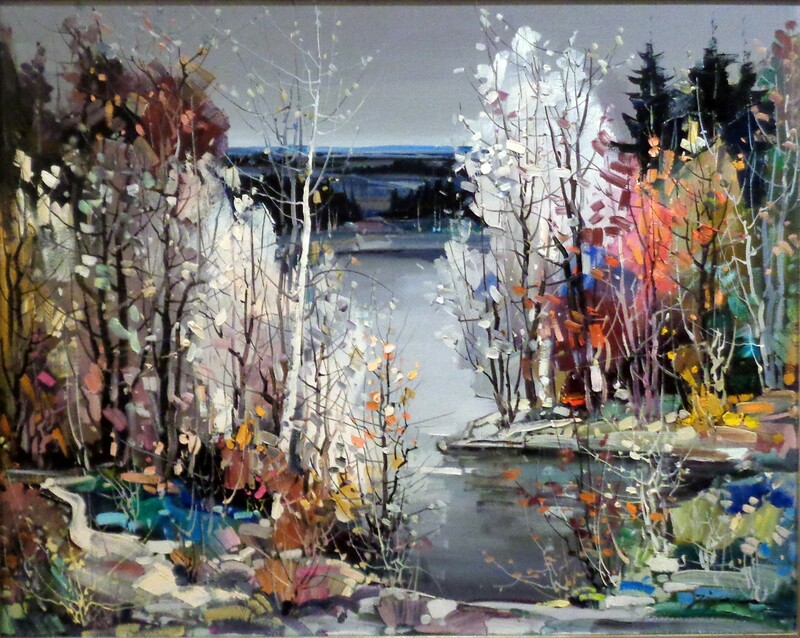 He finally settled in Canada in 1968, becoming one of that country’s most renowned artists and the youngest of 25 elected Senior Members of the prestigious F.C.A., or Federation of Canadian Artists. Tinyan’s work reflects the diverse cultural influences in his life. Even when working in the strict discipline of the Chinese brush painting tradition, Tinyan scatters exuberant and undisciplined patches of brilliant color throughout his compositions. 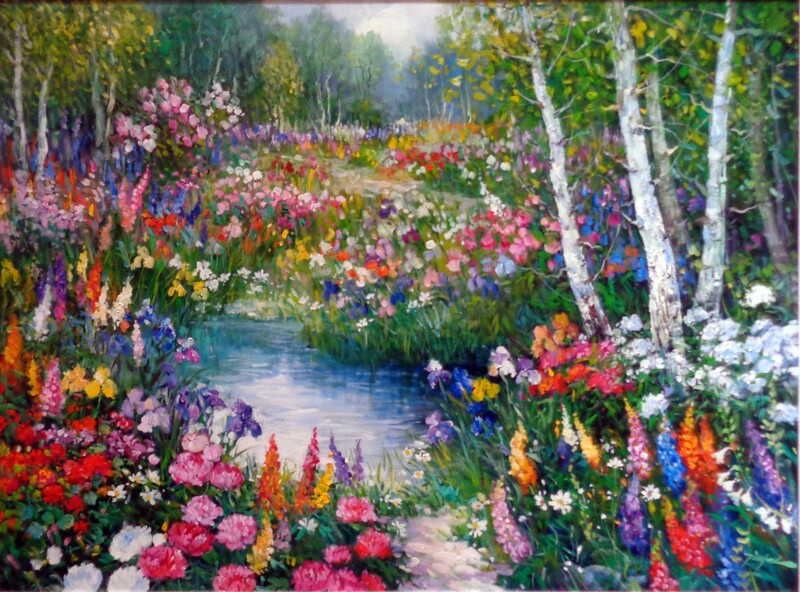 Similarly, when the artist creates a very Western, impressionistic floral scene, he will depict the flowers displayed in Asian vases and bowls, taken from the extensive collection of his wife, Nita. Despite the diversity within the body of his work, Tinyan’s brilliant balance of Eastern and Western components serves as a stylistic link between floral and landscape, between oil and traditional Chinese brush painting. 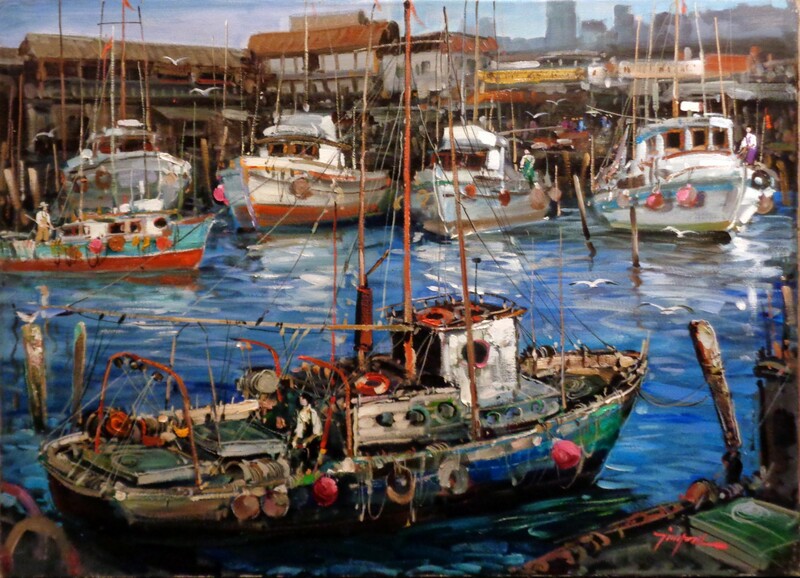 Internationally shown and widely collected, Tinyan is a master painter of the highest caliber.